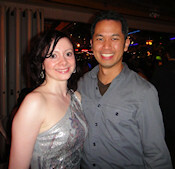 I recently went to Take the Lead Dance Studio for their Christmas salsa party on December 19th. It was very unique because there was a cocktail hour from 8-9pm, where all the salseros could eat and drink an assortment of crackers, cheese, vegetable tray, and fruit snacks. At 9 pm there was the usual salsa dance lesson. It progressed rather quickly from extreme beginner to beginner-intermediate moves. Garincha made it fun and interesting. To my surprise, the salsa lesson quickly became a salsa rueda. Now, here’s where things became a little odd because no other dance studio does this. There was social salsa dancing for a while, and then there were performances. The first performance was some sort of fusion tango, then there was an african dance and a couple more performances. None were salsa. Then after the performances, Garincha showed us a movie that the studio did. I was a little perplexed why we were watching a movie, but it became apparent at the end when Garincha explained it all. Take the Lead Studio is a place where you can learn many different things, not just salsa. His studio now specializes in african dance, flute lessons, salsa lessons, and acting (which explains the video).